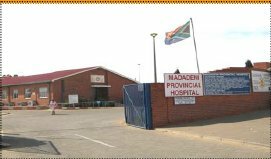 Madadeni hospital is both a regional and district hospital located in Madadeni Location Section 6 which falls in Amajuba health district. Directions to Madadeni hospital. The catchment population served by Madadeni hospital is 366 935, and includes the affluent community from nearby towns and the previously disadvantaged community of the townships and rural settlement areas. The hospital is supported by 15 fixed clinics and 3 mobile clinics. Madadeni hospital has 1620 authorised and 1154 usable beds. Madadeni hospital’s vision it to be the best regional hospital in the province of KwaZulu-Natal in partnership with the community that we serve. This is supported by the hospitals mission statement and core values. The hospital achieved baby friendly status in 2004 and was awarded 1st position in T.B Management. Employment opportunities at Madadeni hospital and patient information.